Do not wait until Christmas to taste this delicious Blackberry & Apple candy cane! Taste the delicious flavour of blackberry and apple in this white candy cane with pink and lavender stripes. 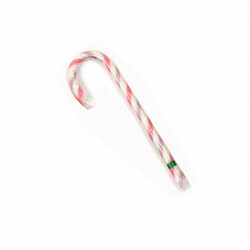 Without any artificial flavouring or colouring, the Original Candy barley sugar candy canes are available in an amazing range of taste. Initially these candy canes were hung in the family Christmas tree, and are now enjoyed at any time of the year by the young and old alike! This candy cane is 18 cm long. This candy cane is sold individually. Based in Bourne End, Buckinghamshire, in the South-East of England, The Original Candy Company is renowned for its expertise in confectionery. They craft a wide range of delicious candies from classic and timeless canes made from natural ingredients to custom-made candies. Ingredients: sugar, glucose syrup, citric acid, natural flavourings, natural colourings: carminic acid, carrot juice.